A dentist who offers laser dentistry is using the very latest dental technology available. Laser dentistry relies on highly targeted laser energy to focus precisely on affected teeth and gums without damaging surrounding healthy tissue. 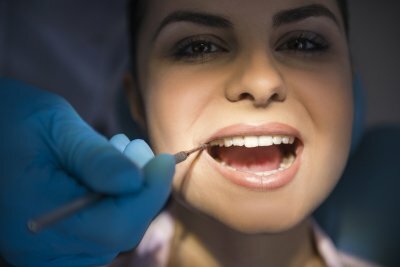 A dentist can use laser dentistry to perform a wide range of procedures, ranging from non-invasive techniques to surgery. Read on to learn more about the uses of laser dentistry, including filling decayed teeth, performing root canals, and correcting gum disease. A dentist regularly uses lasers to fill cavities and correct tooth decay . Laser dentistry is ideal for both preparing cavities and removing caries. Instead of the high speed drill which elicits fear in many children and adults alike, laser dentistry eliminates caries in the path of the tiny and targeted laser beam. When it comes to filling cavities, laser dentistry is both comfortable and safe for even young children. Laser dentistry is also ideal for completing a root canal procedure. In many cases, laser dentistry is so painless that it requires no shots at all. For many people, just the idea of a shot of local anesthesia produces dental anxiety. While laser dentistry takes slightly more time to remove infected inner tooth tissue during a root canal, most people feel no discomfort at all during the procedure itself. A laser dentist may also recommend laser treatment for gum disease. Periodontal disease was formerly treated with invasive surgery that forced many patients to spend days in painful recovery. With laser dentistry, a dentist can treat both the beginning stages of gum disease and the more serious side effects that accompany advanced periodontal disease. Glenwood Premier Dental is pleased to offer WaterLase laser dentistry from our dentist in Hazlet. Find out more by calling us at (732) 264-4477 to schedule a consultation with a dentist. We have an emergency dentist on staff to meet all your needs. Our office also offers dental exams, teeth cleanings, and the very latest techniques in cosmetic dentistry.